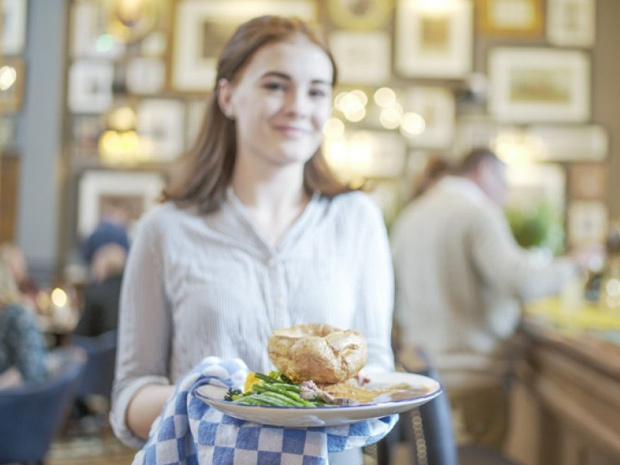 Gather together family and friends and head to one of the top Gloucestershire restaurants featured in SoGlos's Sunday lunch guide. Discover where to treat yourself to a delicious Sunday lunch across Gloucestershire. From hearty family-friendly roasts to decadent three-course feasts, SoGlos has selected a host of Gloucestershire eateries offering delicious Sunday lunches for all budgets and taste. So, this weekend leave the cooking and washing up to someone else and discover where to tuck into a leisurely Sunday lunch across Gloucestershire and the Cotswolds. Housed in a restored engine house, The Fire Station is a lively restaurant and bar that offers a laidback setting for enjoying Sunday lunch with friends and family. The Sunday lunch menu features the likes of chicken liver parfait with grape chutney, truffle butter and toast; charred king prawns and gremolata; and crab risotto with samphire, pea shoots and lemon oil, to start. The roast dishes span pork belly, Aberdeen Angus sirloin, and chicken, served with roast potatoes, whole roast carrots, greens, peas and Yorkshire pudding; while there’s also a veggie option of roast squash, sage and mushroom pithivier. If a traditional Sunday lunch doesn’t take your fancy, the menu also features the likes of grilled lemon sole with sauce vierge; a cheeseburger and fries; and guinea fowl shish kebab with smoked aubergine, tzatziki and flatbread. The fine selection of desserts include dark chocolate and salted caramel tart; lemon posset with raspberries and vanilla shortbread; and sticky toffee pudding. 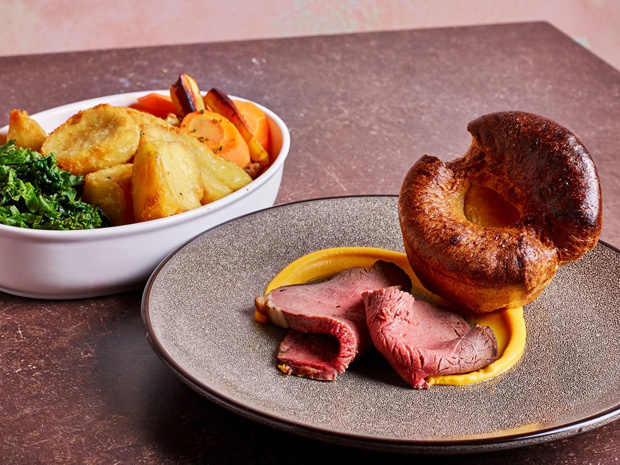 You can also opt for the Bottomless Sundays offer, with two courses £35 and three £40 for a Sunday roast, plus unlimited prosecco or Bloody Marys. Or, if you’re an early riser, you can enjoy the same offer for brunch, with two courses £30 and three £35. Starters are from £5, main courses from £12, and desserts £5.50. Call (01242) 809135 or visit thefirestationcheltenham.co.uk directly. 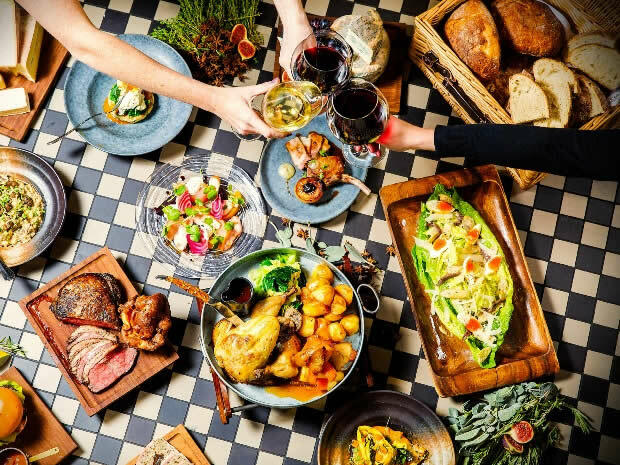 Located in the chic surroundings of Cheltenham’s Malmaison hotel, Chez Mal Brasserie offers the perfect setting for savouring Sunday lunch with friends or family. Start your lunch in style with a drink in the lounge, bar or conservatory before heading into the restaurant for the main event. Chez Mal’s delicious Unlimited Sunday Lunch menu kicks off with help yourself starters from the Chef’s Table, including a selection of hors d’oeuvres; Caesar, Caprese, and Greek salads; soups; shellfish and seafood cocktails; Serrano ham; Ibérico chorizo; artisan breads, cheeses and chutneys. Diners can then choose to enjoy a brunch dish, including a full English, the Mal Benedict; a main course, spanning the Chez Mal burger, smoked haddock fishcakes, and crisp West Country lamb with chickpea, roast pepper and apricot terrine; or one of the Sunday roasts, served with spring greens and roast vegetables. Add a decadent finale to your meal with one of the indulgent dessert options, including raspberry ripple sundae, hot chocolate pudding, and a classic crème brûlêe. If you want to make it an extra special Sunday, choose from one of the tempting cocktails or opt to have unlimited Prosecco with your lunch for just £15 extra. The Unlimited Sunday lunch menu is £19.95 per person, dessert can be added for an extra £3.50. Call (01242) 370655 or visit malmaison.com directly. This stylish bar and AA rosette restaurant is tucked away in the heart of Pittville. Located inside the boutique Cotswold Grange Hotel, The Drawing room is open to both residents and guests. Serving a delectable range of British cuisine, it’s a perfect spot to enjoy a Sunday lunch, washed down with a delicious cocktail. Head chef Tim Townsend has created an exceptional Sunday menu. Starters include smoked salmon and wasabi; goats cheese mousse; and butternut squash soup. A roast topside of beef with carrot puree tops the main menu, with the drawing room’s ever popular roast pork belly also making a Sunday appearance. But save room for dessert! The drawing room has a choice of traditional British favourites including rhubarb and custard; lemon tart; and carrot cake to add a sweet finish to your meal. The lovingly refurbished dining space at the Cotswold Grange is decorated with bespoke artwork from mixed media artist Teresa Poole. Oriental style birds and even a large mural sit perfectly alongside the distressed walls and modern copper accessories. The space really is a beautiful place to dine. Sunday roast is £21.95 per person for two-courses or £25.95 for three-courses. Call (01242) 515119 or visit cotswoldgrangehotel.co.ukdirectly directly. The Old Courthouse, as the name suggests, is housed inside Cheltenham’s former court room. Located in the town centre, The Old Courthouse is a restaurant and pub which opened in 2018, serving a menu fused with traditional favourites and more adventurous flavours, along with a range of ales, wines and spirits. Starting your Sunday as you mean to go on, why not enjoy one of The Old Courthouse’s delicious cocktails, ranging from a Bloody Mary through to a Rhubarb Bellini. It’s the perfect way to celebrate Sunday! To start, options include seasonal English asparagus with poached egg and a pancetta crisp, smoked salmon cheesecake topped with lemon jelly, beetroot hummus or baked garlic and rosemary camembert. For the main, choose from rare roasted topside of beef with Yorkshire pudding, roast loin of pork, or braised shoulder of lamb. And, if that’s too much choice, diners can even select a mix of roast beef and pork. The Old Courthouse’s pudding menu is enough to tempt even the fullest of stomachs, spanning sticky toffee pudding, toasted waffles with caramelised banana and banoffee ice cream and a lemon meringue roulade with raspberry sorbet. This eclectic menu offers a number of non-traditional Sunday Lunch choices such as charcuterie, spicy Vietnamese king prawn and rice noodle salad, and crispy beef salad; so there’s something to suit all tastes, even if a roast dinner isn’t your thing. Sunday lunch dishes are priced individually with starters beginning at £3.45, Roasts start from £12.95 with other main dishes priced from £11.75 and desserts priced from £5.25. Call (01242) 500930 or visit brunningandprice.co.uk/oldcourthouse directly. Located in the charming village of Asthall near Burford, The Maytime Inn is an independently run Cotswold pub offering a relaxed setting for enjoying a laidback Sunday lunch experience. The pub’s award-winning chef uses the finest local ingredients to create a tempting choice of starters, mains and desserts on the two or three-course Sunday lunch offering. While the menu changes regularly, diners can expect starters such as chicken liver parfait with red onion marmalade; smoked tomato croquettes, ham hock terrine; and soup of the day with crusty bread. The choice of meats span chicken, lamb and pork, which are all served with the traditional accompaniments, while the Cotswold beef also includes perfectly cooked Yorkshire puddings. Those looking for an alternative to roasts can expect main course dishes such as pan-fried salmon with new potatoes, spinach and white wine sauce, along with veggie options including butternut squash and sage risotto. Save room for dessert, with the menu featuring the likes of apple and cinnamon crumble; chocolate mousse with berry compote; baked goat’s cheese with figs and honey; passionfruit cheese; and a selection of ice-creams and sorbets. The Maytime Inn has an extensive wine menu and gives diners the chance to sample varieties not usually offered by the glass. There is also a fine selection of real ales to try, while the bar stocks in excess of 100 types of gin! Sunday lunch is £21.95 for two courses or £24.95 for three. Call (01993) 822068 or visit themaytime.com directly. The Royal Oak is located in the heart of the town of Tetbury and offers a charming setting for cosy Cotswold Sunday lunches. 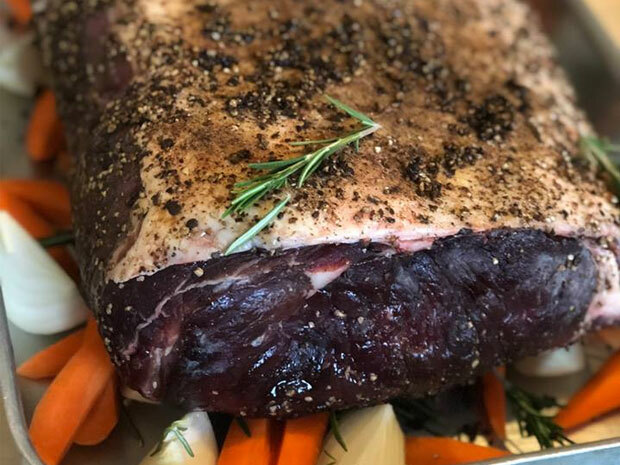 The pub specialises in serving organic food, with its Sunday lunch offering changing weekly to ensure that you always get to sample exciting dishes when enjoying a weekend visit to The Royal Oak. Make sure you book a table in advance as the pub gets very busy on Sunday lunchtimes. Served from 12pm to 4pm, the seasonal dishes on offer include starters such as pickled herring and crème fraîche; wild garlic mushroom with toasted sourdough; Asian-style crab caked with chilli sauce; and confit of game with homemade pickles. For main course, sample dishes span homemade vegan nut roast; organic roast chicken with sausage, sage and onion stuffing; and organic rib of beef, with roasts served with Yorkshire pudding, roast potatoes, parsnips, seasonal veg and gravy, while there’s also a fish special of the day to choose from. Autumn berry crumble with vanilla ice-cream; baked vanilla cheesecake; and pumpkin and maple pie, give a flavour of the desserts on offer, and there’s also an artisan cheese board to tempt diners. On Sundays, visitors can also take advantage of The Royal Oak’s DIY Bloody Mary Bar – perfect for banishing any Saturday night cobwebs – while there’s often live music to enjoy as well. Starters from £5, main courses from £10 and desserts from £7. Call (01666) 500021 or visit theroyaloaktetbury.co.uk directly. Téatro is a stylish bar and restaurant located in Cirencester. The eatery prides itself on working with local suppliers to use the best ingredients for its creative, seasonal dishes. The Sunday lunch menu is served from 12pm to 4pm, with booking advisable. On Sundays, Téatro offers a delicious menu that has something to tempt all palates. Whet your appetite with a choice of starters, including the likes of French onion soup; beetroot and goat’s cheese tart; duck liver pâté, and haddock and salmon fishcake. The main course roast dishes span Hereford beef with Yorkshire pudding; sirloin of British pork; and free-range chicken, all served with the classic trimmings. If you don’t fancy a roast, other options include fish and chips; twice-baked cheddar soufflé and a Cotswold wagyu burger. Diners can round off their Sunday feasting with delicious desserts such as coconut parfait with pineapple, mango, passion fruit and dark chocolate; pecan pie with maple, salted caramel ice-cream and honeycomb; or a selection of ice-creams and sorbets. Expect a delightful atmosphere when dining on a Sunday as guests can soak up live music played from the baby grand piano. And make sure you sample some of the impressive selection of gins that are on offer. Starters from £5.50, mains from £11.50, and desserts from £4. Call (01285) 648238 or visit teatro-ciren.co.uk directly. Located in the heart of Gloucester, Café Rene is an historic pub, restaurant and grillhouse offering a relaxed and friendly environment for enjoying a get together with family or friends. Café Rene, housed in a former stable, has an authentic feel to it and is known for its unique décor that includes ceilings lined with wine bottles. Every Sunday, Café Rene serves a roast dinner, with pork, beef and lamb on offer, while there’s also the option to have a mix of all meats. Enjoy your roast with all the trimmings and make sure to save room for the tasty desserts, with choices including homemade cheesecake, sticky toffee pudding, chocolate fudge cake, strawberry and Champagne roulade, or cheese and biscuits. The regular restaurant menu is also available, with everything from homemade chicken and mushroom pie and fish and chips, to steaks and Café Rene’s famous Desperate Dan Burgers, with jacket potatoes, sandwiches and salads available for those wanting a lighter meal. Make sure to sample the pub’s very own cider or enjoy a craft beer or two, with plenty of soft drinks and coffees also available. The Sunday roast costs from £8.95. Call (01452) 309340 or visit caferene.co.uk directly. 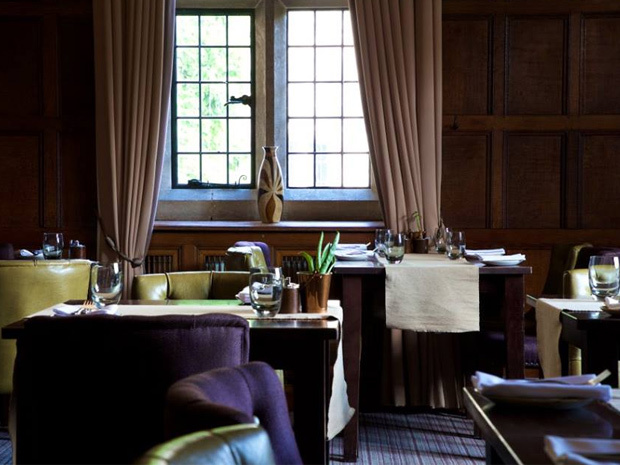 Enjoy Sunday lunch in the elegant surroundings of 17th century manor house hotel, Hatherley Manor. Set in 37 acres of rolling countryside on the outskirts of Gloucester, but in close proximity to Cheltenham, the hotel’s Dewinton restaurant uses the finest seasonal ingredients and sources the best local produce for its menus. A two or three-course Sunday lunch is served from 12pm to 2pm. Diners can expect starters such as tomato and basil soup; ham hock and smoked chicken rillette; and steamed mussels with chorizo tomato sauce. Sample main course options include roast Stroud Valley beef with Yorkshire pudding; baked fillet of salmon with roasted peppers and a creamy white wine sauce; or honey roast turkey, served with chipolata and roast potatoes. Dessert options feature tangy rhubarb parfait with chantilly cream and a berry compote; apple bread and butter pudding, or chocolate and orange torte. Hatherley Manor’s Loyalty Membership scheme offers guests the chance to earn points when you eat, stay or have coffee, along with giving diners 20 per cent off food and drinks on Sundays. A three-course Sunday lunch is £21 for adults and £10.50 for children aged two to 12, while there’s also the option for adults to have two courses for £16.50. Call (01452) 730217 or visit hatherleymanor.com directly. Situated between the Rivers Wye and Severn, Severn & Wye Smokery is an award-winning independent business situated on the edge of the Forest of Dean. Following an extensive renovation project, the smokery opened The Barn in 2017, encompassing an open-plan restaurant, modern theatre-style kitchen, fish market, café, deli and shop across two floors. The Barn offers a relaxed setting for guests, who can enjoy everything from classic breakfast dishes to cream teas, along with main meals on Sunday that offer an alternative to a traditional roast. The extensive restaurant menu comprises a variety of dishes, spanning tasters, smaller hot and cold plates, Severn & Wye classics, and seasonal fish cooked on a grill or over charcoal, in addition to a choice of seasonal sides, sauces, and children’s meals. Ideal for sharing, small plates include rock oysters, hot-smoked mackerel, whitebait, scallops, and crevettes. 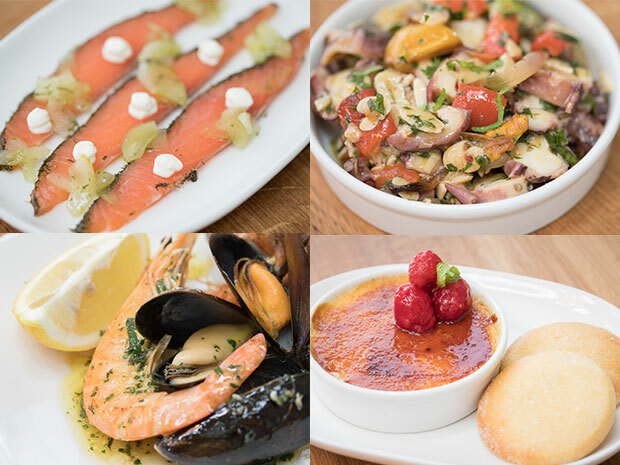 The restaurant classics encompass a fish platter of smoked salmon, hot-smoked trout, gravadlax and herring ceviche; kedgeree; deep-fried filled of cod; Mediterranean dish soup; and catch of the day. Meanwhile the choice of seasonal fish includes everything from yellowfish tuna loin and Dover sole, to seabass and Brixham red mullet. If you’re not a fish fan, there are also meat options such as free-range poussin and rib-eye steak. What’s more for younger diners, there are options including chicken goujons, sausage roll, and fishcake. Diners at The Barn can take the opportunity to browse its fish counter, deli and gift shop. The impressive fish counter boasts a wide range of shellfish and fresh fish, whilst there is plenty of quality local produce on display in the deli, including an array of quality cheese. Over in the shop, there’s the chance to snap up thoughtful foodie gifts such as condiments, crackers and luxury chocolates, in addition to items such as cookware, coffee, wines and beer. Tasters start from £3, small plates start from £2.50, classic dishes start from £11.50, seasonal fish starts from £12.50, sides start from £2, children’s meals cost £6. Call (01452) 760191 or visit severnandwye.co.uk directly. 17th-century manor house hotel, Stonehouse Court, is situated in a picturesque location overlooking the Stroud Water Canal and offers a delightful setting to enjoy a delicious Sunday roast. The hotel’s Court Brasserie serves up a two- or three-course lunch every Sunday – providing the perfect excuse to let someone else do the cooking and washing up on the traditional day of rest! The two- or three-course set Sunday Lunch Menu includes starters of soup of the day with homemade cheese straws; deep-fried whitebait with paprika mayonnaise and charred lemon; ham hock terrine with piccalilli and chargrilled ciabatta; Stilton stuffed mushrooms with mixed leaf salad and spicy tomato salsa; and prawn cocktail with freshly baked break. Main course dishes include roast sirloin of beef with Yorkshire pudding and red wine gravy; crispy pork loin with sage and onion stuffing, apple sauce and gravy; fillet of cod with Parmentier potatoes, wilted spinach and creamed leeks; wild mushroom and spinach gnocchi with Parmesan salad; and crispy pork lion with sage and onion stuffing with apple sauce and gravy, all served with a selection of seasonal vegetables. Diners can round off their meals with cinnamon-spiced apple crumble with vanilla ice-cream; lemon tart with Chantilly cream and mixed berry compote; homemade bread and butter pudding with custard; sticky toffee pudding with toffee sauce and vanilla ice-cream; or a selection of cheese and biscuits. If you’re dining on a sunny day, enjoy a pre-lunch drink on the alfresco terrace and soak up the pretty gardens, while during the winter months the lounge makes the perfect spot for an aperitif. The Sunday lunch is £16.95 per person for two courses and £19.95 for three. Call (01453) 794950 or visit stonehousecourt.co.uk directly. Enjoy Sunday lunch in the unique setting of Egypt Mill, a restored 16th century mill that’s been transformed into a laidback family-friendly restaurant. Located in the heart of Nailsworth, the restaurant offers a varied menu on Sundays, with dishes to tempt all palates. Kick off your Sunday feasting with a selection of the appetisers and nibbles, including deep-fried halloumi chips with sweet chilli mayo; garlic, chilli and chorizo tiger prawns; and lightly dusted calamari. Diners can expect starters such as celeriac and apple soup with Parmesan and hazelnut oil; crab and gruyère tartlet; and wild mushroom and spinach pithivier with poached leeks. For the main event, indulge in a Sunday classic of roast topside of beef; roast loin of pork; or the chef’s vegan nut roast, served with all the trimmings. There are also of plenty of choices if you fancy something a bit different, with the chef’s pie of the day; fish and chips; rump steak and the Egypt Mill burger on offer. Save room for dessert, with the restaurant’s sweet choices including favourites such as sticky toffee pudding and Mississippi mud pie. And if you can’t decide what you fancy, there’s a decadent taster of desserts served with a hot drink. The restaurant also serves giant Yorkshire puddings filled with roast beef, pork or a vegetarian alternative, and roast potatoes, making a delicious twist on the Sunday favourite. Starters from £5, main courses from £10.50, desserts from £3.95. Call (01453) 833449 or visit egyptmill.com directly. Promising to bring a true taste of Italy to the heart of the Cotswolds, Toni’s Kitchen in Stroud’s Bisley House, offers an ever-changing seasonal menu, from the team behind successful local pizzeria company, Fat Toni’s. Combining the family run business’s Italian roots with classic French finesse, the menu offers simple dishes with playful twists, hand prepared on site. While the Sunday menu changes seasonally to ensure the freshest produce is always available, popular Sunday dishes include starters, or Primi of chicken tortellini in its own broth; N’duja glazed ribs with farro salad; and tempura vegetables with sweet chilli dressing. Mains, or Secondi, include dishes such as Cotswold pork chop or roast rump of pepper and ash beef, served with roast potatoes, roast root vegetables, seasonal greens, stuffing and gravy; pesto and artichoke lasagna with a mixed leaf salad; and prawn and pea risotto. If meat isn’t for you, Toni’s Kitchen offers an eclectic vegetarian and vegan menu, with a range of specially designed starters, mains and desserts to ensure you can still enjoy the fabulous flavours that Toni’s Kitchen has to offer. Starters are priced at £8, mains are £16 and desserts cost £8. Coffee and petit fours or affogato are £5 each. Call (01453) 751328, or visit toniskitchen.co.uk directly.